If you are a female rider who is concerned about style and a bit of moto-safety then Speed and Strength has your back. Literally. Look no further than the Black Heart Moto Shirt. The Speed and Strength Black Heart Moto Shirt has a perforated leather frame. To increase the comfort Speed and Strength has also include shoulder expansion gussets to extended range of motion. 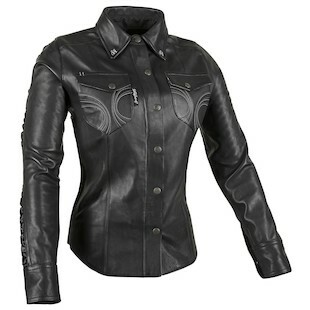 Additionally, the Women's Black Heart Moto Shirt features a mesh lining that should come in handy in humid weather. While Star Wars may be hip again, looking like a Stormtrooper is not. Speed and Strength knows that there are still riders out there that like to wear denim, leather chaps and now cool leather motorcycle shirts. Be cool, stay cool and keep it classy!